Demand for vegan haggis at Tesco in Scotland has skyrocketed by 120 percent over the last year - with more people expected to buy the Scottish delicacy in the run-up to Burns Night on January 25. Traditionally, haggis is made from sheep heart, liver, and lungs, mixed with onion, oatmeal, and stock. The vegan option features a blend of pulses, seeds, and vegetables mixed with oats and spices. Now Tesco will trial the vegan version in stores in England and Wales in a bid to meet demand. Its two top-selling meat-free haggis, which have been only on sale in its Scottish stores, are made by Simon Howie and Macsween and have both recently been approved by The Vegan Society. "The current clamour for vegan and vegetarian food has really helped send sales soaring for the non-meat version of the haggis," Tesco Scottish Food Buyer, James Lamont, said in a statement sent to Plant Based News. 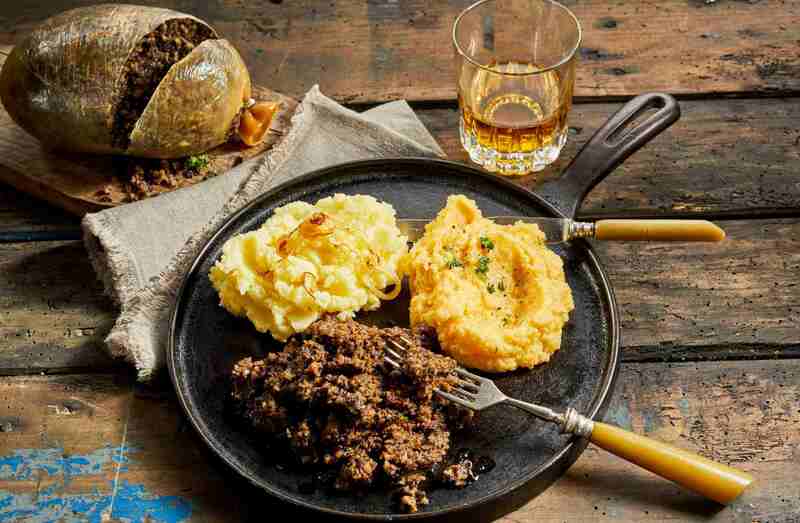 "Even though vegetarian haggis has been around for a few years we've never seen anything like the current demand – and it's not just during Burns’ week, it's all year round! "Veggie haggis is a delicious meal in its own right not too dissimilar to a nut roast and we think vegetarians and vegans are buying them as centerpieces for roast dinners."